Florence is one of the top cities to visit in Italy. This northern-Italian beauty is filled with amazing 15th century architecture, delicious food and wine from the Tuscan region, and some of the most important works of art in the world. Florence is also a great city to visit if you are a fashion-lover. Although Florence is considered a very expensive city to visit, there are certainly ways to do so on a budget. Here are some of my tips for enjoying Florence without breaking the bank. The most popular months to visit Florence are April through June, but they are also the most expensive, and most crowded. You may be tempted to go in the mid-summer months of July and August, but I don’t recommend it. Not only is it super hot and humid, but most Italians leave for vacation in August. With so many places closed, you’ll be missing out on some of the best shops and restaurants, and the Florentine vibe that is worth experiencing. In my opinion, September and October are the best months to visit. Although there are cheaper months, like January, September and October offer beautiful early-fall weather, and decent flight prices. 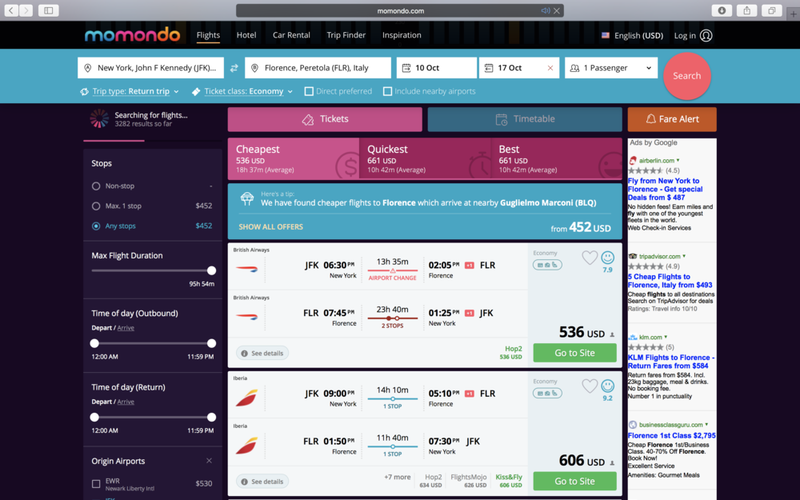 My favorite site to search for flight fares is Momondo.com, as I usually find the cheapest fares there. Ever since I discovered it, I haven’t used many other flight search engines, but that’s just a preference. In addition to having cheaper fares, I like that it gives me suggestions on how to get a lower fare. Momondo.com - Don't forget to use a private window! Tip! I personally fly Delta for long flights, also a personal preference because I’m a SkyMiles Member. However if you’d like to get the lowest fare, you should consider airlines like Lufthansa and Iberia. When I was in Europe, my go-to site - even before Momondo, was always GoEuro.com. What I love about GoEuro is that it compares ways of getting to your destination - by air, train, or bus - based on the price and how long each method takes. The first time I visited Florence (from Rome), I had not yet discovered GoEuro, so I ended up paying €40 ($42.50) for a train ticket. The second time however, I was able to get a FlexiBus for €13! The only downside was that the bus ride took double the time (1.5 hrs by train; 3-3.5hrs by bus), but I was fine with that because I was able to save money. Tip! If you’re traveling to Florence from another European city, I still recommend using GoEuro, and considering budget airlines like EasyJet and RyanAir, for flights under €100. Tip! After checking GoEuro, if you decide to travel by air, double-check on Momondo to make sure you are getting the best fare. Airbnb - I love Airbnb, and have never had a bad experience booking accommodation through them. The prices are great, and you get to feel like a local. The only downside to staying at an Airbnb in Florence is that most are located outside the city, in the Tuscan countryside. I was lucky, because my Airbnb came with a bike, and was right by Parco Delle Cascine, a gorgeous (and huge) park that leads straight into the city. Hostels - Disregard the movie Hostel! I’ve stayed at a few hostels and have always had a good experience. It’s a great way to save money, and to meet other travelers - especially if you are traveling alone. A lot of hostels even come with breakfast included, sell alcohol for cheap, and provide you with a ton of information and deals for things to do. I recommend searching on HostelWorld.com, Hostels.com, or even on Airbnb for good hostels. I’ve never stayed at a hostel in Florence, but I can recommend PLUS Florence, since I stayed at PLUS Berlin, and it was one of the best hostels I’ve experienced. PLUS hostels have a chic hotel vibe, but with the benefits of a hostel. Hotels - Still prefer a traditional hotel but don’t want to pay a crazy amount? Check out Hotels.com which offers really great hotel prices, and Lastminute.com, which can be a bit pricier, but offers 10 - 15% off on many hotels. Museums - With art, sculptures, and beautiful renaissance architecture, Florence itself is a museum. Being called “The cradle of the Renaissance”, Florence is filled with amazing museums and some of the most famous art pieces and sculptures in the world. Tip! For the Uffizi Gallery and Galleria dell’Academia, be sure to get your tickets online, and show up early, since these are the most popular, and the lines are long. Tip! Check museum hours and days; most museums are closed on Mondays, as well as some national holidays. Duomo and Florence Cathedral: Main landmark in Florence; Beautiful Renaissance church. You can also go to the top and get a great view of the city! Unfortunately, I did not visit many restaurants while in Florence, but my friend Jennifer who studied abroad there has a few suggestions for y’all! Yellow bar: Via del Proconsolo, 39r, - Reasonably priced, Vegetarian and Vegan friendly, and you can make your own pasta. Osteria Il Gatto E la Volpe: Via Ghibellina, 151/r - Jennifer’s, and many people’s favorite in Florence, great table wine, authentic, and affordable. Tijuana: Via Ghibellina, 156r - Delicious Mexican in case you’re not in the mood for Italian one day (strangely, that happens). My Suggestion: Make sure you do/attend an Aperitivo or two - they are a huge part of Italian culture. An Aperitivo, or “apericena”, is a pre-dinner social event in which you have drinks (traditionally wine or Aperol Spritz), along with a selection of appetizers (antipasti). Many places offer a buffet of appetizers, with your first drink free, for as low as €7. They are excellent if you’re eating on a budget. I’m that person that will grab 3 - 4 plates, and call it dinner - sorry, not sorry. Florence is an awe-inspiring city that is definitely worth visiting on your trip to Europe. Did you find this guide helpful or inspiring? Let me know. Been to Florence and have some other great budget tips? Share the wealth below.